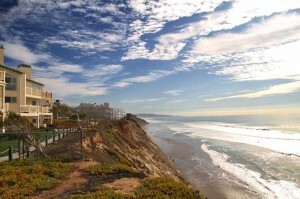 Sitting atop tall bluffs overlooking the Pacific Ocean just a 30-minute drive from downtown San Diego, the town of Solana Beach is home to approximately 13,000 residents. An affluent community surrounded on its three landward sides by equally affluent Cardiff-by-the-Sea, Del Mar and Rancho Santa Fe, it offers a mix of the charms of yesteryear with the conveniences of today. Development began here in the first couple of decades of the 20th century, enjoyed a surge after World War II and most recently in the last quarter of the century. The town’s Cedros Design District is a hotspot of boutiques, art galleries and cafés. There is a weekly farmer’s market and the monthly Gallery Night. The comprehensive Solana Beach Chamber of Commerce website offers more information.